This finishing stuff is addicting! I've finished a pair of socks that had been hanging around for a long while. Now, back to the second Mullet sock. 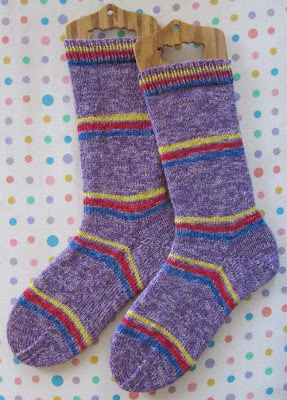 There are also other unfinished socks in my queue and someday, I just know it, I'll start a brand new pair of socks!! The stripes match perfectly. Very pretty!